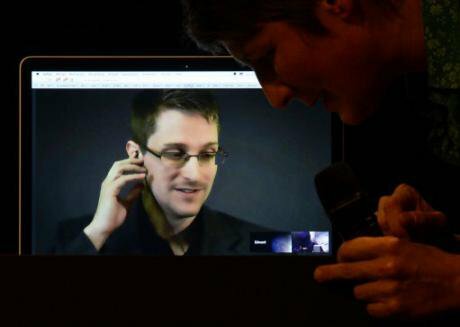 Edward Snowden on a laptop, receiving the Stuttgart Peace Prize from the organization Die AnStifter in 2014.Thomas Kienzle/Press Association. In October 2014, and following Edward Snowden’s surveillance revelations, the National Union of Journalists (NUJ) in the UK wanted to bring people together to discuss the implications for the media industry, as a whole but with a particular emphasis on front-line journalists. These are the people who are approached by the public and any media workers who handle sensitive or secretive information about terrorism, politics, crime, misconduct, corruption, human rights, civil unrest, protests and social movements. We organised the conference with the International Federation of Journalists (IFJ) in London which was attended by journalists' representatives from around the world. Although we did not know it at the time, the event marked the starting point of a campaign that is not over yet. The authorities can listen to telephone calls and read emails… also access computers or phones regardless of encryption. The UK state surveillance powers are vast. They include the interception of communications; the authorities can listen to telephone calls and read emails. They can also access computers or phones regardless of encryption. They can tap into documents, diaries, contacts, photos, videos, messages, and geographical location apps. They have the power to detect what is typed into a device, including passwords, draft documents and deleted files. Government hackers are also able to switch on microphones, video and cameras. That IFJ conference agreed to challenge the state’s ability to secretly access journalistic communications, materials and sources – known as “investigatory powers”. In the weeks before the conference the NUJ found out the police had secretly accessed a national newspaper’s newsdesk phone and they had targeted journalists’ mobile phone records. The following year a report revealed that 19 police forces had made 608 applications for communications data to find journalistic sources. This week, tribunal judges ruled that Cleveland police had used these surveillance powers to seize local and national journalists' phone records. The 1984 Police and Criminal Evidence Act (PACE) requires the authorities to contact a journalist or media organisation before accessing their work. This legislation enables journalists and media organisations to challenge the request in an open court. Using the PACE legislation, in the past the NUJ has won many legal victories to protect journalists’ work, integrity and sources. The authorities no longer have an obligation to contact a journalist or media organisation when they want to access information stored on electronic devices. But in 2016, the government used changes in technology, including the increasing reliance and use of smartphones, as the basis to move away from the long-standing procedures and protections offered by PACE. The authorities no longer have an obligation to contact a journalist or media organisation when they want to access information stored on electronic devices. The UK government claims that information stored on electronic devices is owned by the communications provider so they can now go to the companies to get this information in secret. When the authorities proposed that these fundamental changes should form part of the Investigatory Powers Bill, we were alarmed by the lack of safeguards. We responded by building a broad campaigning alliance to oppose the threats. We linked up with the Press Gazette to launch the “Save our Sources” petition; we organised a series of events in parliament and we worked alongside the Bar Council and Law Society. We also drafted alternative proposals, secured cross-party consensus and tabled a series of amendments to the bill in the House of Commons and in the Lords. We contacted the Society of Editors and the News Media Association to organise a united campaign. Nevertheless, the government continued to push the legislation through with little regard for the impact on press freedom in Britain as well as the ramifications for the rest of the world. The proposals became law in the Investigatory Powers Act in November 2016. Similar legislation has also come into force in other countries, including Germany, France and Australia. The UK government claims that information stored on electronic devices is owned by the communications provider so they can now go to the companies to get this information in secret. When journalists don’t know their work and their sources are being compromised, it becomes practically impossible to uphold the NUJ’s ethical code of conduct which enshrines the principle of protecting sources. This is crucial because most journalists rely on the public for information and sometimes people will only speak to the media and share information on condition of their anonymity. Many news stories, ranging from the Panama Papers to MPs’ expenses, are based on information provided by anonymous sources. The state should not have the power to secretly identify then persecute these whistleblowers. At the end of last year the NUJ welcomed the decision of the European Court of Justice (ECJ), which ruled the UK government's general and indiscriminate retention of email and electronic communications was illegal. Despite this damning judgment, the government has not even responded to this decision. In this new climate we need to renew our efforts to build an international campaign. The lack of legal safeguards continues to threaten the ability of journalists to do their work without state interference. In this new climate we need to renew our efforts to build an international campaign that includes those who care about press freedom in countries that have introduced repressive surveillance legislation. We must also build new working practices, using the tools available, to offer some protection against unjustified snooping on journalists, their work and sources.